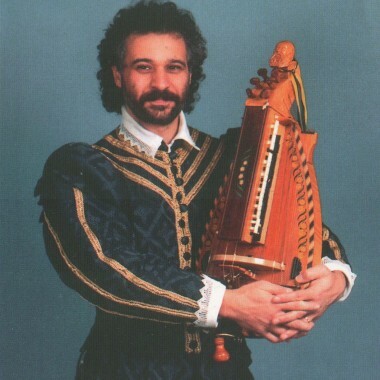 Dante Ferrara, superbly costumed minstrel specialising in music and songs of Renaissance Europe. Great for Medieval themes, Venetian masquerades and so much more. Dante Ferrara, “no ordinary Elizabethan minstrel”. Dante Ferrara is passionate about performing and passionate about giving his listeners a memorable experience. Whether his music is for an intimate dinner party, a wedding or a large-scale event his enthusiasm for entertainment cannot be surpassed. 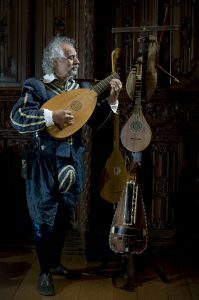 He has a selection of exquisite costumes and plays the hurdy gurdy, lute, cittern, English bagpipes and the extremely rare colascione. His songs range from romantic Florentine and Neapolitan songs to risque English ballads. 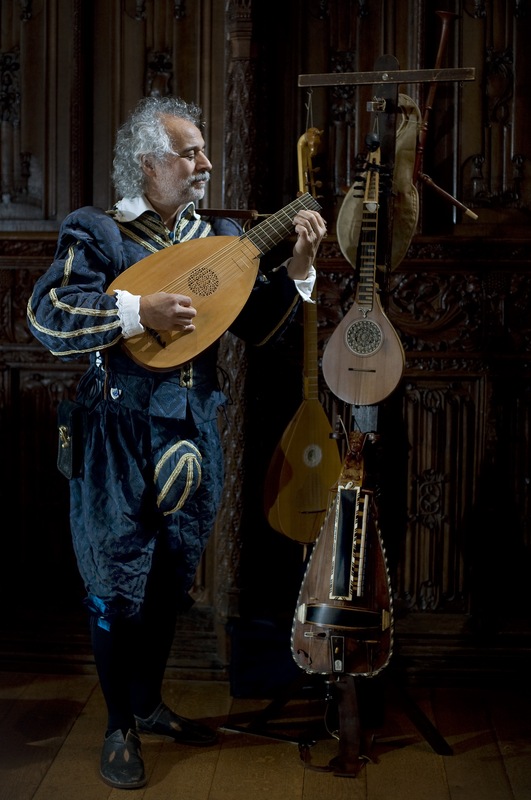 Dante has performed in countless historic settings in the UK and abroad. He is perfect for any occasion requiring quality period music and his total professionalism guarantees delighted clients. Dante Ferrara’s concerts are usually informal and informative, often exploring the grey area where courtly culture meets popular culture. ‘Rosasolis’ consists of 16th century Italian and English programmes. Part one features works by Kapsberger, Santino Garsi da Parma, Giorgio Mainerio and anonymous Neapolitan love songs. Items on the colascione are played in this programme. Part two is entirely English and comprises mostly of music on the orpharion and cittern. Featured composers are John Dowland, Robert and John Johnson, Thomas Robinson, Francis Cutting and anonymous ballads. 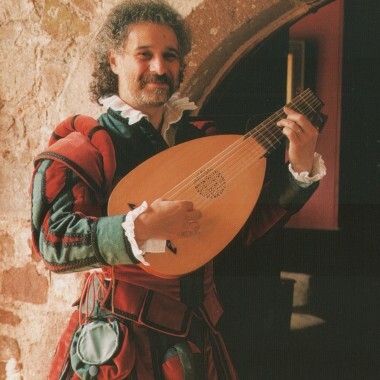 A mixed first half of English, Italian and French music and songs on lute, cittern, orpharion, hurdy-gurdy and colascione. The second part focuses on Henry Purcell and his contemporaries. Concert programmes can also be created to accommodate a theme or anniversary. Dante also offers a show, Finery & Filth, which combines early music, spectacle and stand-up comedy. Set in 1695, it takes the audience through a vivid and ribald tale of Restoration England…and the Restoration Rat Pack. Available in three versions: Concert – 2 hours including interval / Festival – 1 hour / After dinner – 30 minutes. Warning! Finery & Filth contains lyrics not suitable for those of a Puritan disposition. • Entertained most of the Royal Family at Alton Towers for the Knockout Tournament staged by Prince Edward. Also present were several Dukes and showbusiness personalities including John Travolta, John Cleese, Cliff Richard, Mel Smith, Griff Rhys-Jones, Rowan Atkinson, Adam Faith, Tom Jones, Christopher Reeve and Meatloaf. • Entertained at the home of Bill Wyman for a party commemorating the 800th anniversary of his village in Suffolk. • Entertained Luciano Pavarotti after one his his rare concert appearances in England. • Entertained Elton John and his guests at his Windsor home for his Aids Foundation Gala Dinner, July 2000. • Entertained at Antonio Carluccio’s London opening party, November 2000. • Sang the ‘Blackadder’ theme song to Rowan Atkinson.